Fourways Aesthetic Centre is proud to announce the launch of the Neoretin range of highly effective skin lightening products. The range contains two products – Neoretin GELCREAM SPF 50 for daytime use and Neoretin SERUM* for intensive day and/or night use. 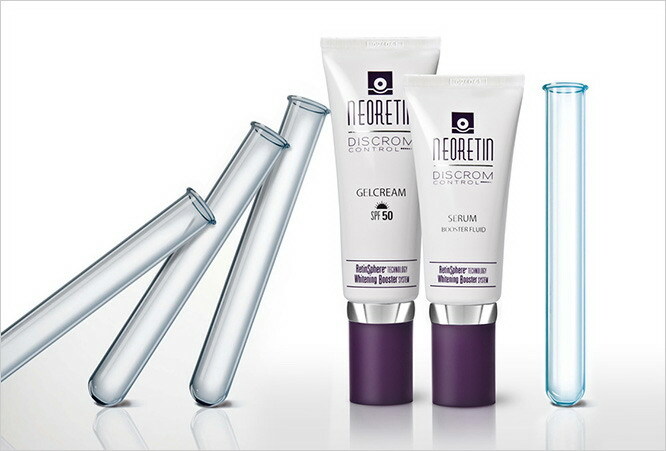 Neoretin is a daily skin lightening regimen for melasma, dark spots and uneven pigmentation. Ingredients in the Whitening Booster System act to inhibit all stages of melanin production, whilst the new RetinSphere retinoid technology offers the efficacy of retinoids without the side effects. Neoretin is suitable for skin which does not tolerate hydroquinone (HQ), or when HQ use is discontinued. works in combination with skin lightening procedures (peeling, IPL, fractional non-ablative laser, dermabrasion). is excellent for use in post aesthetic procedures to prevent postinflammatory hyperpigmentation. GELCREAM contains a high SPF 50 for daytime coverage. has an excellent galenic formulation which ensures full skin coverage and rapid absorption. *Use of a sunscreen is recommended.